Many special jackpot sit n goes. Account balance visible in lobby. Software could have been prettier. Still in a growing phase. No stakes categories are available. Only Texas Hold'em and Omaha available. You’re looking at a typical British poker room. We say typical because the services look much like the ones Ladbrokes and other U.K. based companies provide. But don’t let the shell scare you. 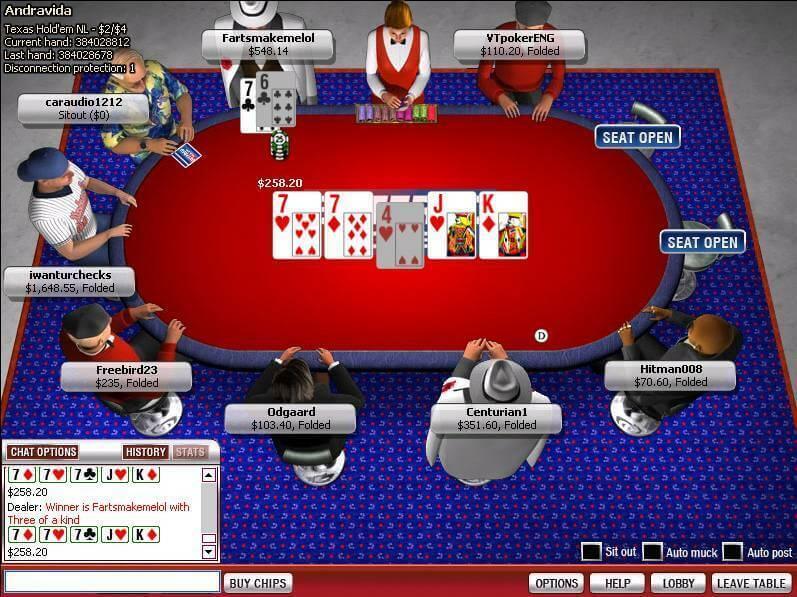 There are many valuable tournaments bundled to this poker client and a respectable amount of active players. What we don’t like is the visual interface and the low variety of games, but then we have a nice bonus, fairly soft competition and a 24/7 customer support whenever in need. Pretty graphical interfaces has never been on Betfred’s agenda. The website feels a bit like 1999 and the software is adequately looking. Fortunately, it is still very crisp graphics and you will not have to browse a jungle of unnecessary applications options. Besides the obvious functions, they have buddy lists, player notes and more. We particularly like the hand playback feature, which basically consists of an interface with your hand history, what happened and so on. The only real setback, except for the visuals, would be the disability to choose between different limits. There is currently no way to select No Limit games and separate them from Fixed Limit and Pot Limit, which can get a bit messy sometimes. Bet Fred hasn’t been in the market for very long, but is growing because of its aggressive marketing, specifically in the United Kingdom market. As expected, Texas Hold’em is the number one game of choice to most players, but you will be able to find a game of Omaha, too. There’s typically over 2000 players connected. The tournament play is heavily promoted at Betfred. Although traffic isn’t very high, you will still be able to play sit’n go games at $100 buy-in or more. Most of the action is in the low buy-in games, however. Besides the sit n goes, there is a respectable amount of scheduled games and events as well as a bunch of jackpot tournaments, and if you’re into freerolls, you will be happy to know that there are many of them as well. 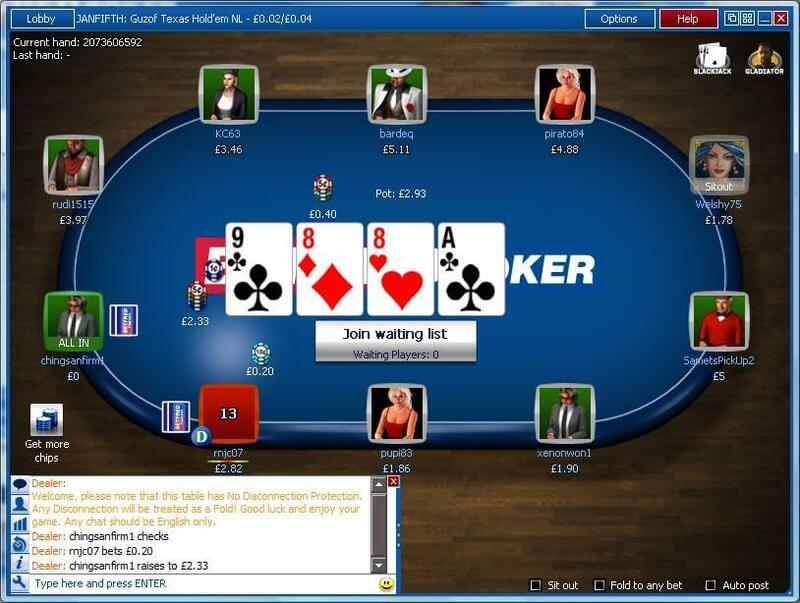 Bet Fred offer Texas Hold’em, Omaha and Omaha Hi/Lo only. Available game modes are Pot Limit, No Limit, Turbo mode, Heads-ups and a special fun mode game type. 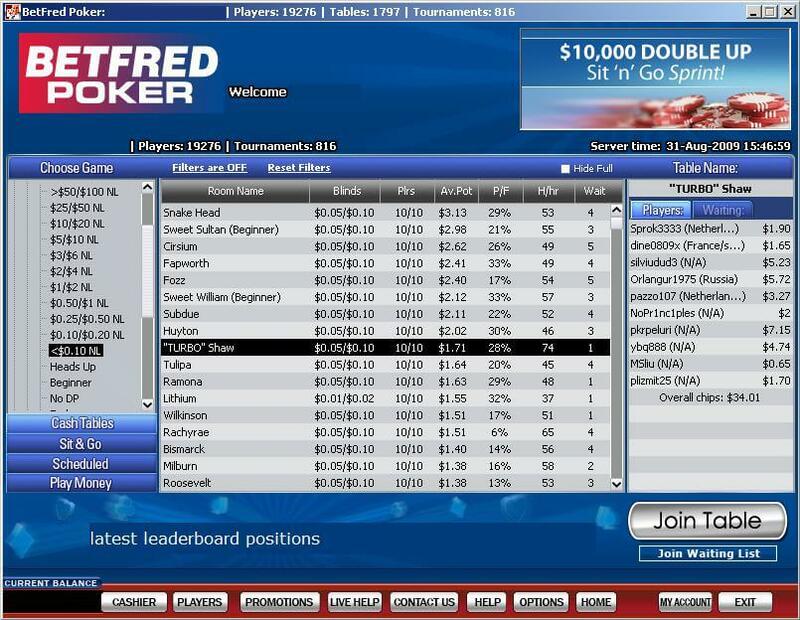 Betfred have approached with a rather aggressive marketing and have attracted a lot of new players who are new to the poker world. The low and medium stakes are usually not very difficult to play at and you will be able to find a fish or two. High stakes usually consist of players who see the flop 40 percent of the times, which is standard at these levels. The sign up bonus at Bet Fred is one of the most generous welcome bonuses on the internet. You get a 100% bonus ranging up to $1000, meaning that you can deposit $1000 and get $1000 if you meet the requirements. To do so, you must acquire 1,000 points for every $10. This is a fairly quick process, but playing at low stakes with $250 in mind will take too much time. We recommend everyone to stick to $1/$2 or more to cash out a fair amount. Note that you gain points for playing tournaments as well. To find out more, visit our BetFred promotion code page. The loyalty points are awarded when you play your raked hands. This is any hand at $0.25/$0.5 or more. These points can be turned into various promotions as well as refill bonuses, which vary from time to time. Betfred offer a wealthy bonus which you can read about above. Besides the generous bonus, Betfred offer a $1 million tournament, four different Jackpot Sit N Go competitions and freerolls. The freerolls are divided into two different categories, namely one that offers cash prizes and one that serves as a satellite to larger tournaments. Further on, Mondays have turned into Manic Mondays which is basically a tournament frenzy. Last but not least, a handful WSOP tickets are handed away every year to those who win the satellite events. You have all the customer support options available at Betfred. 24/7 telephone support, live chats and e-mail conversations are available. The quality of the support is good and accurate personal when needed and usually very fast. Deposits: Credit Card, checks, bank drafts, wire transfers, bank transfer system (BTS), NETeller, PrePaid ATM, Citadel, Western Union and FedEx. Cashouts: Credit Card, check, bank draft, wire transfer, bank transfer system (BTS), NETeller, PrePaid ATM, Citadel, Western Union and FedEx.